qtomaster has no other items for sale. Great EBay Seller, item as described, very fast shipping, highly recommended. Awesome Seller, Super Fast Shipping!!! 2 Thumbs Up!! Item as described. Fast ship. I needed a second small flash for my Sony A6000 and since I have the Nissin i40, initially purchased a few years ago for about $145, I decided to get another unit. However, the Nissin is now priced significantly higher (~$260+) than what I had initially paid! This makes it irrelavant choice for me. 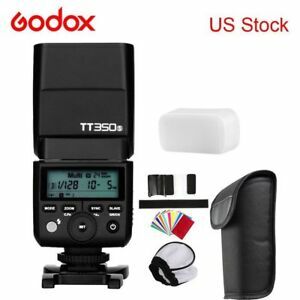 I did some research and came across the Godox TT350s which costs (~$84) considerably less than the i40, though it's a bit larger in size and uses two instead of four AA cells, it functions very well. I have used other Godox equipment and I've found them to be very well made and highly functional. The Godox's output with respect to its GN (guide number) according to specs is roughly 118 (36m) at ISO 100, 105mm vs the Nissin's 105 (at ISO 100 and reflector set to 105mm), This variance amounts to roughly less than 1/2 stop difference, IMO, not enough to be worried about. The Godox's recycle times, again according to specs is faster as well with its upper range of 2.2 vs 4 seconds. Of course these times may be recorded using different methods, e.g., using alkaline vs, NimH or using some other measuring criteria. How many shots can one expect from one set of batteries is not known; I haven't tested this feature, but one would GUESS that with two versus four AA cells, the life from on set of batteries in the Godox should be shorter than that in the Nissin - carry an extra set or two if you opt for the Godox! One very important feature that's absent from the Nissin is wireless 2.4GHz remote control (which is a built-in feature of the Godox - to get this from Nissin, you'd need their i60). However, the Nissin does have a video light feature; how valuable that is, is subject to speculation. A Nissin shortcoming causes me consistantly and unknowingly alter the compensation dial on the flash - it is essentially 'friction free,' so it moves very easily! There IS NO locking mechanism to prevent this. All controls are effected with two mechanical/electrical dials. The Godox uses contemporary LCD with push-buttons; the likelihooh of accidentally altering the settings is completely absent. Summary: with its price (about 1/3 of the Nissis), its features, and its ease of use, it doesn't take a genius to decide that the Godox is the better choice. reasonable recharge time. indoor use bounce iso 400 works pretty well. of course direct flash is plenty powerful. For HSS, its weak.
. Good flash but slightly weaker compared to normal size flash. Size is great for daily carry. Neat and very effective for a small flash unit.